The last day is a Sunday, the day I’m most likely to forget…. AND my parents will be here so hopefully we are doing something fun so I’m pre-writing this to put my mind at ease. Today I want to tell a story. It isn’t my story exactly, it is my sisters (and her family) and it is so bad it wraps around to funny again. Technically it is more funny because I got to ‘enjoy’ it from afar, and, teasing your sister is fun. A young family; 4 kids under 10, mom is a nurse with crazy hours that only nurses can understand/survive, and, an active duty pilot dad who too long ‘vacations’ to ‘sandy places’ and even when he was home he had flights and duties at all odd hours. What is a responsible family to do about the inevitable time they are both away? Who will wash/feed/entertain/transport/and love their crew when they are working? Hire a Nanny of course. Nanny #1 was an angel. A Texan in every sense of the word from big heart to big personality, she loved those kids and when she went to go get married (and move) the bar was set high! I only mention nanny #1 because how could any other nanny measure up, this was actually part of the problem, since nobody they interviewed was ‘as good’ they had to settle…. they thought that their eyes were just dazzled by the brilliance of #1 but little did they know they accidently allowed an entirely sub par person into their life. Over the next while (not sure how long actually) she started with the little things like things going missing. “Maybe we lost it?” they think. Then expensive lotions etc were all used up without permission or exclamation. “Maybe I forgot I used it?” they think. Then there was the time she hit a big rock with their car and didn’t fess up – news flash; 8 year olds are very good reporters and when backed up by siblings parents go with the eye witness. Things go this way with none of the kids even liking her that much but with all the life happening there is no time to replace her. Devil you know and all. My sister comes back from a deployment and after this and that decides to go back to school and stay home full time thus making the Nanny a moot point. This did save them any actual confrontation and everyone parted in the standard midwest way. Or so you might think…..
A few months later, like a bad penny…. Like the story of Other Kate, this one is ongoing. 2 people so far have called. Seriously, to put people you sued (even if all the other stuff was imagined) as a reference does not speak well of what you have done to the other people you worked for. Hopefully got some good ones! Professional lighting is so great, now I know why models look so perfect. There is a lovely women in Ireland that writes books, the one that pulled me in was about art and motherhood. Last year I was included in her ‘blog carnival’ for her book “The Rainbow Way” and ever since I’ve been in facebook-group contact with her and a group of like minded women. I’ve learned more about how motherhood and art happens in Ireland and England over the past year than I ever thought I would learn *because* I assumed (incorrectly) that it would be just about the same there as here. 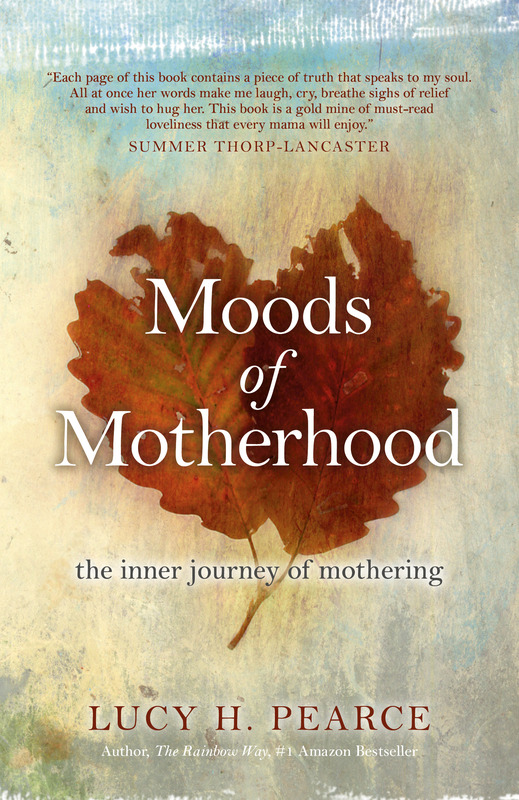 Today she is releasing another book; “The Moods of Motherhood” and she asked the group of us to post something about our feelings on the Moods of Motherhood (the general topic, not the specific book). We did get a copy of her book to download and I did not have time to read more than the forward that does explain a lot; She started out with a blog and the premise that there are so many sides to motherhood and most of the less perfect things are done in private. So she blogged. She was probably right person at the right time with the right words and she found tons of support and a ton of ‘me to’ from the world of women looking to the internet for shared experience and validation or help or just knowing that someone else feels that way sometimes. This book is a collection of essay/blog style chapters and while it tells a story it isn’t a story. I’ll be reading it over the next while but she asked us to write something for release day so I’m writing before I really read. Manic – is technically the word to describe the positive, crazy, “productive” side of the manic/depressive syndrome and it is often used to describe the whole enchilada of manic depressive syndrome. I feel like kids are all in a mini manic depressive state constantly because their emotions are just so close to the surface and swing so quickly and I feel that mothers often end up being a reflection of the moods of our children. I’ve heard the (lame) phrase that “If momma’s not happy, nobody’s happy” and that is absolutely untrue. If mom is unhappy you would be lucky if your 2 year old notices. If a 2 year old is unhappy the whole world will know! I find myself in constant maintenance of their little bodies and lives to attempt to keep the controllable variables under control. On one hand I would say there are tons harder things out there, but, I think it is not as easy as people think either for the single reason that it is a constantly changing environment. Mom basic – feed child, sleep child, play with child. Those are very broad categories and the building blocks of a happy kid. The devil in the detail is figuring out what, how much, when, of each thing will work and then know that it is very likely to be different the next time. This creates some pretty crazy situations and sometimes when you have it all running smooth and everyone is happy and playing and behaving then you take a second to bask in the peace. I smile and sometimes nearly cry with the odd perfection of the moment. Those moments are so special because they are rare. Not just rare to occur but rare to notice… That is part of the manic mood because peace can go to war in one misplaced doll/lego/drink and sometimes you jump from situation to situation that you miss appreciating the peace in between. I know that my moods also affect them so keeping myself positive is as much part of my day as keeping them fed because both are important to creating a balance. I don’t want to get too wordy here, but, I have to say that re-reading what I’ve written thus far makes me sound like my life is defined by my children and they are ‘in charge’. For the record, I try to keep the ‘me’ (that has evolved over time and has had a solid 10 years of being an adult without children) alive and well but it is undeniable that kids change how you operate on every level. I have time that I carve out for this or that and I still feel like I have self beyond my mother side, but, I KNOW that I do get pulled into their moods even if I try to rise above them. At the end of a stressful day and everyone is in bed I feel the responsibility of it all slipping away and I feel better. At the end of an awesome fun day and everyone is in bed I feel some of the fun and energy drain away. When I can physically recognize an absence of kid emotion that means that it does, absolutely, affect me. Today is a bright and sunny day here, only thing we could ask for is maybe something above zero temperatures…. The time lapse thing is fun but the cold keeps eating my battery so we look up and suddenly it is off again but we did get some fun ones and I’ll render them all when I have time. I’m on a quick break because we needed staples so Lars is at WalMart. By the way, Thank You all who are working today! Not just the convenience of being able to get things we forgot, but, all the police and EMT and hospital people just to name a few. I know people who if it snows, they will be out plowing. I know people that if they get a call for a fire they will leave their turkey cooling on the table to go fight a fire. I know there is back and forth about things being open and people missing holidays but for me, I’ll just throw out a big Thank You and not make judgements on your behalf. The pantry is starting to look like a real room. We ran into all sorts of odd impediments like lights being in just the wrong spot and the wiring being done by a drunk monkey so sorting that out… We also seem to have very very very hard cement because I used 2 drill bits and 2 batteries up drilling 4 anchor holes. The floor is in (and insulated), the studs are up, there is a framed in section for a door and today dad is working on moving switches and outlets and Lars and I put up drywall. Maybe by dinner we will have spackle?